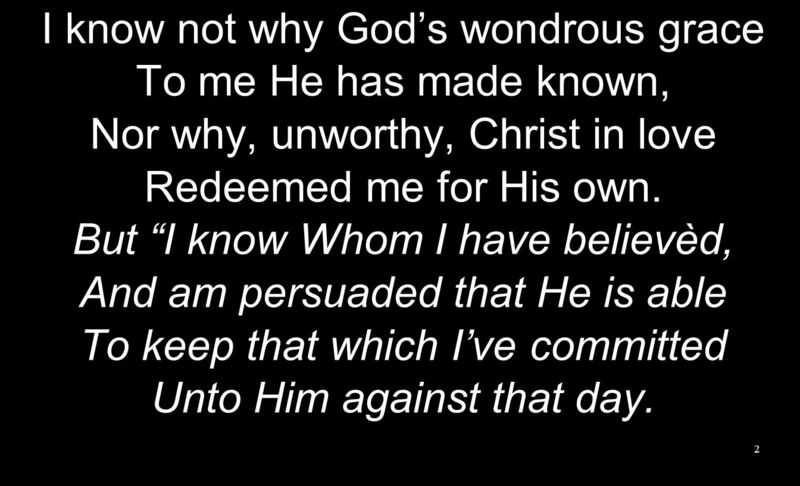 Nor why, unworthy, Christ in love Redeemed me for His own. 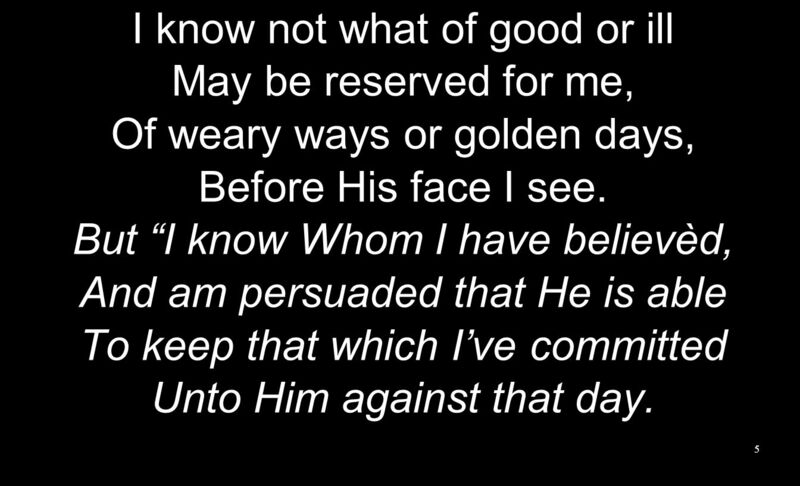 But “I know Whom I have believèd, And am persuaded that He is able To keep that which I’ve committed Unto Him against that day. 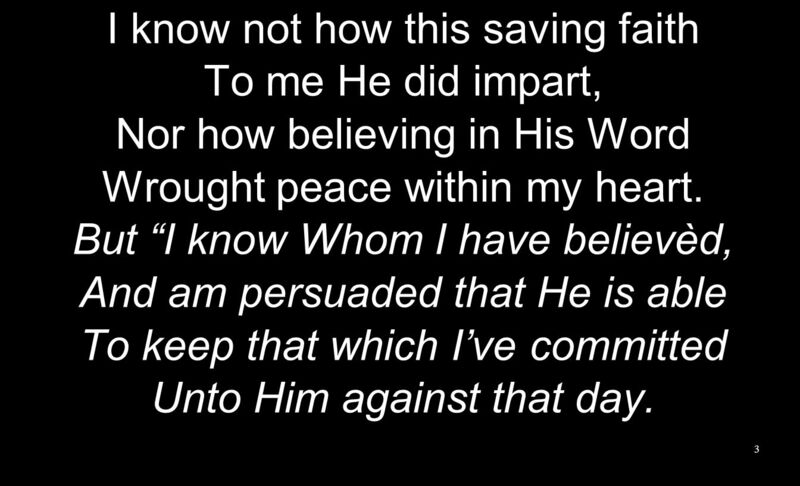 Nor how believing in His Word Wrought peace within my heart. But “I know Whom I have believèd, And am persuaded that He is able To keep that which I’ve committed Unto Him against that day. 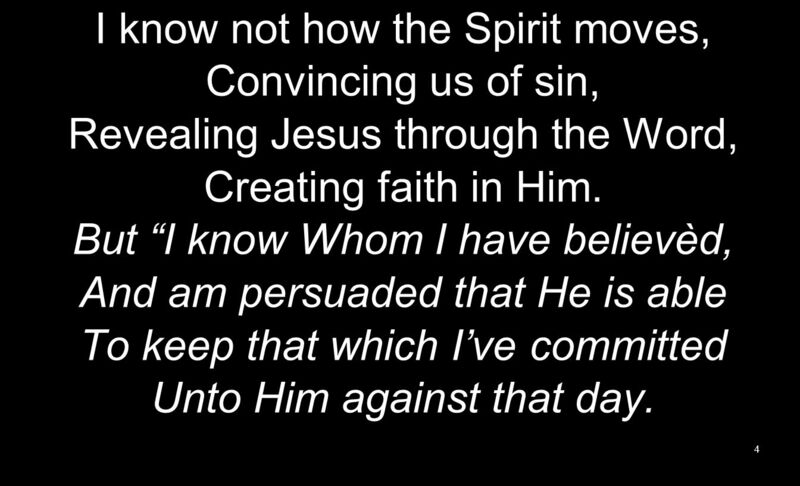 Revealing Jesus through the Word, Creating faith in Him. But “I know Whom I have believèd, And am persuaded that He is able To keep that which I’ve committed Unto Him against that day. Of weary ways or golden days, Before His face I see. But “I know Whom I have believèd, And am persuaded that He is able To keep that which I’ve committed Unto Him against that day. 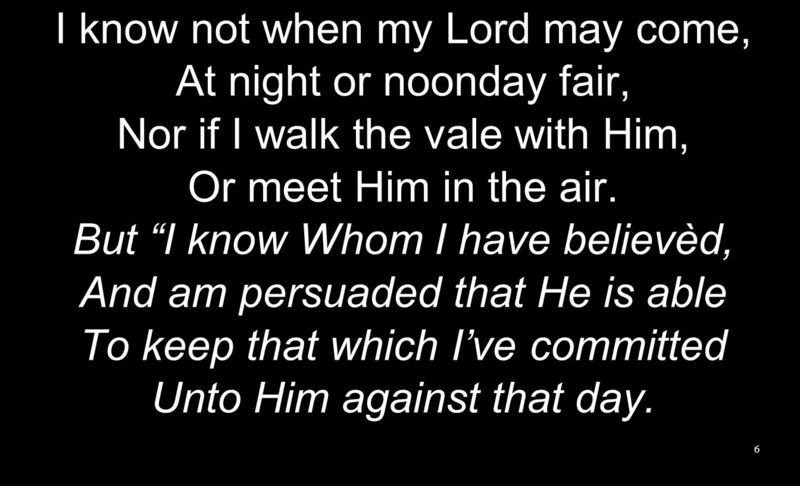 Nor if I walk the vale with Him, Or meet Him in the air. But “I know Whom I have believèd, And am persuaded that He is able To keep that which I’ve committed Unto Him against that day. 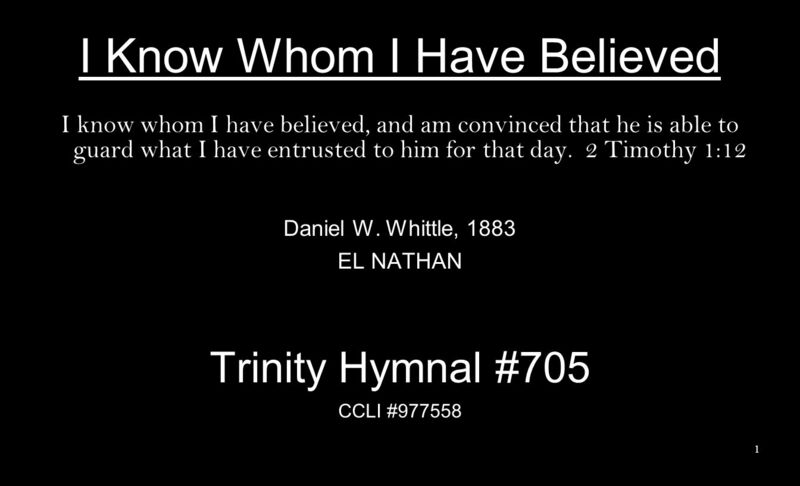 Download ppt "I Know Whom I Have Believed"
LAMB OF GOD Twila Paris CCLI # Your only Son, no sin to hide, But You have sent Him from Your side To walk upon this guilty sod, And to become. Defined by the Gospel 1.Gospel Message – What we believe. 2.Gospel Community – Who we are. 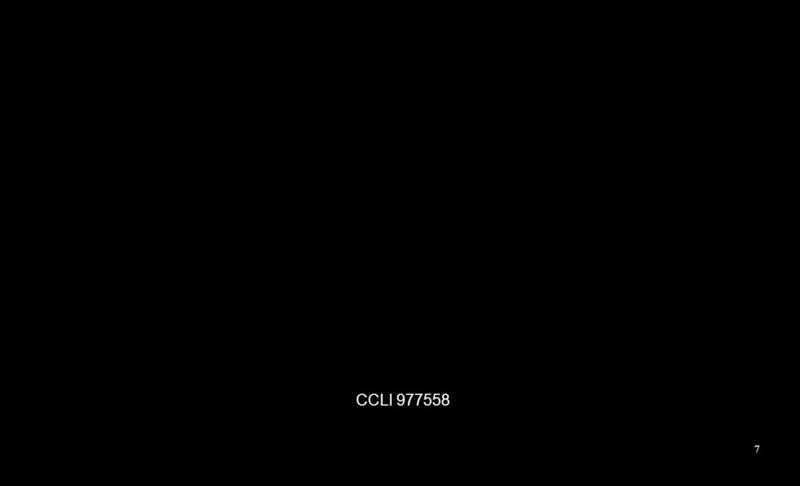 3.Gospel Mission – What we do. 4.Gospel Suffering – How we. How do we walk in Community? WELCOME TO PIONEER EVANGELICAL CHURCH Sunday September 28, 2014. Romans 8 37 No, in all these things we are more than conquerors through him who loved us. What a Wonderful Savior N°335 Christ has for sin atonement made, What a wonderful Saviour! We are redeemed! the price is paid! What a wonderful Savior! MY LORD’S GREAT LOVE The King of all the universe Revealed a love so amazing My Lord, the bright and morning star Left all His glory, for someone such. Wonderful Grace of Jesus Christ Jesus came into the world to save sinners —of whom I am the worst. 1 Timothy 1:15 Haldor Lillenas, 1918 WONDERFUL GRACE.